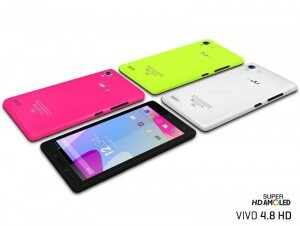 The VIVO 4.8 HD comes in some eye catching colors such as Electric Neon Yellow, and Glimmer Pink, but also in more discrete Matte Black and Ceramic White. There is definitively a demand in the market for bright stand out colors for individuals that want to differentiate from the crowd. In today’s mobile landscape, up till recently, the color choices of devices have been mostly black, white or possibly silver, the increased sales in colorful protective shells shows clearly customers want more colors to choose from. Nokia have made colorful phones for years and when they continued this trend with their Lumia range, a lot of manufactures soon followed suite. Even if Nokia no longer is the market leader it once was, HTC and even Apple with their iPhone 5c have started making more colorful phones as well. Now also BLU Production present some sharp colors to choose from with their devices with impressive hardware, for a great price. Already in production and shipping to several distributors, dealers, and online retailers in the US and Latin America the VIVO 4.8 HD is expected to cost only $249 unlocked. The device is powered by a 1.5GHz Quad-Core Processor with 4G 42Mbps HSPA+ modem, and comes with 1GB of RAM. and 16GB storage memory, and ships with Android v4.2. It also has a 8 megapixel camera on the back, and a 5 megapixel front-facing camera. The downside is that is lacks support for LTE, but for great price, and for the market it is intended, it still is a great deal. Network: 2G (GSM/GPRS/EDGE) 850/900/1800/1900 MHz, 3G (HSPA+ 42Mbps) 850/1900, or 850/2100. Single Micro SIM Card Slot.